The Ants Have Taken Over!! So, our apartment has somehow been completely invaded by ants. The sneaky little guys must have been trained by the special forces of the military because about a million of them invaded completely unnoticed. Well, the war is on. John ran out to buy our own weapons to destroy them with until we can call the office in the morning to kill these terrorists. Hopefully our little traps will be sneakier than their own tactics and they will take the bait right on back to the queen. Wait…do ants have a queen? Hm, maybe they will win this war after all. 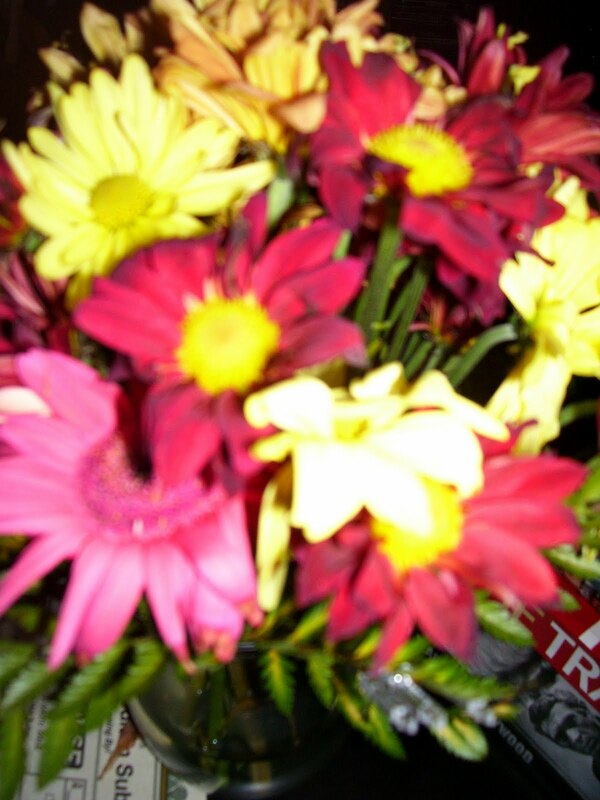 We received a beautiful bouquet of fall colored flowers from John’s family right after we lost the baby. I love anything fall and it was so pretty. 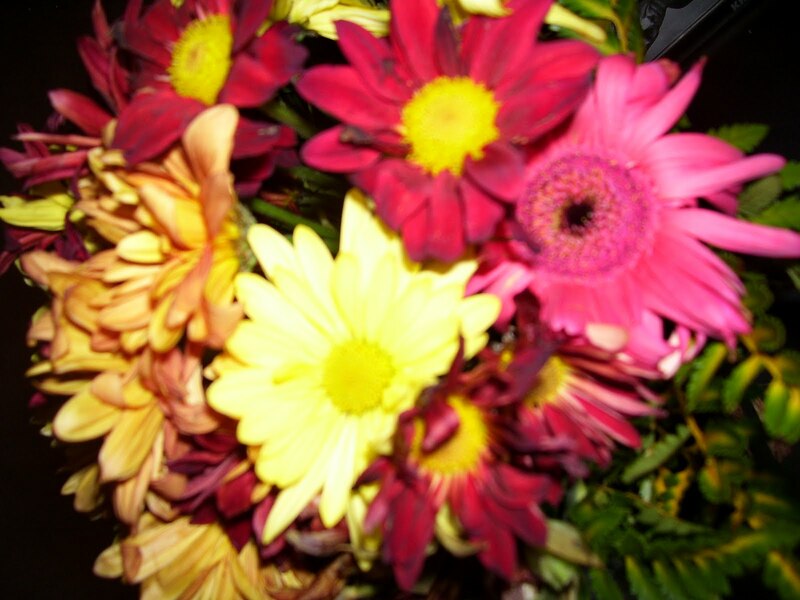 But, I instantly noticed the most odd and out of place flower in a bouquet ever. There was a hot pink daisy among a bunch of garnet and gold. The second I saw it, the second I felt like it was in there for reason. While I was pregnant, especially towards the end, I really began to believe that we were going to have a little girl. So, when I saw the pink flower, I freaked out in my brain. I shared it with John some time before we lit the candle for our baby. 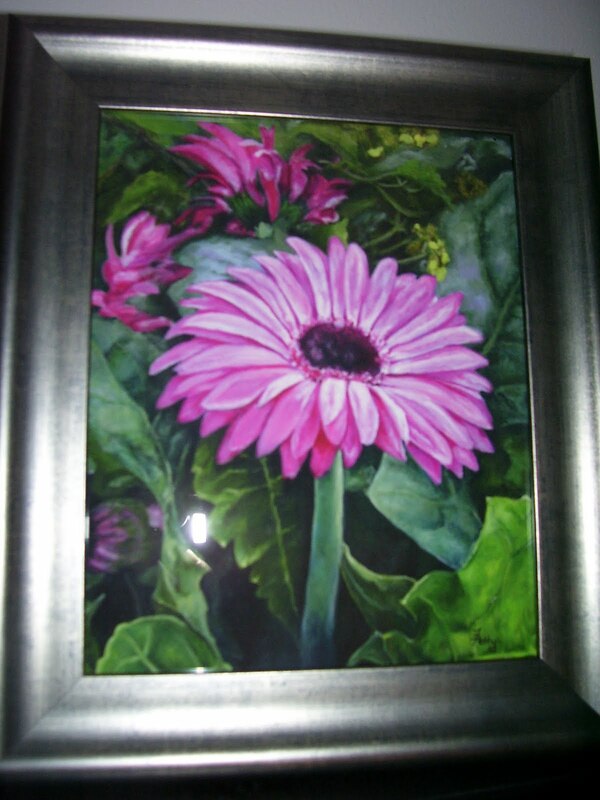 This print was ordered by our friend BEFORE I ever posted anything about the pink daisy (and that’s the only time I’ve “talked” about it with anyone except for John). Are you ready for this? This was painted by Freida Petty. Her paintings all come with a devotional. You can find her artwork at http://www.fpettyart.com This particular painting was painted after her daughter-in-law miscarried her baby. It’s tough to see in this picture, but if you look closely in the center of the flower, you can see the ultrasound image painted there. Then, the devotional continues on to give encouragement to those that have suffered the loss of a child. Isn’t that the most beautiful painting you’ve ever seen?? I absolutely love it! We found the prettiest frame for the painting (which our friend included the cost in the package, so thoughtful! thank you again!). 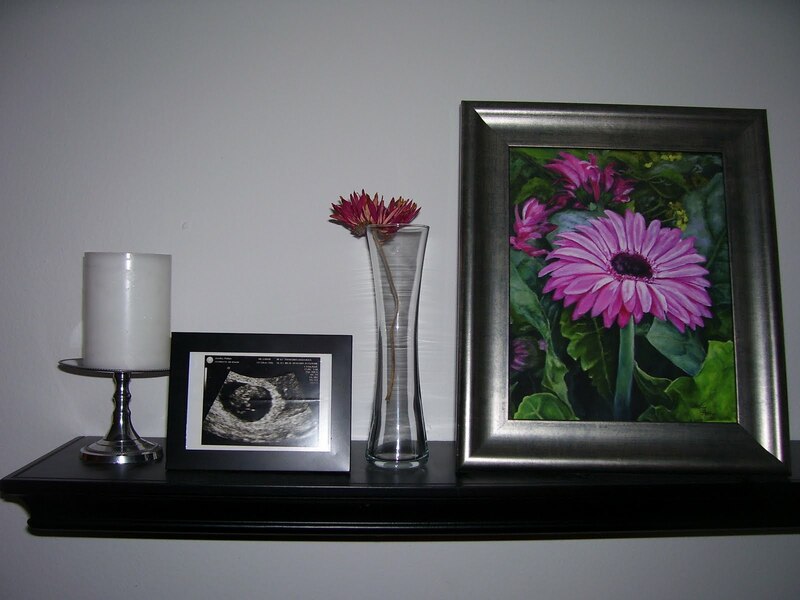 And, we decided to frame our ultrasound picture. We bought a frame for it last night. And, I want to find some pink filler sand to put in the bottom of the vase with the daisy. Sometime soon! But, we do plan to hold onto these four items. I don’t want to forget our first baby. I don’t want to push aside the life that God entrusted us with for 7 weeks and 5 days. Sure, maybe one day the Lord will bless us with children that fulfill their purpose in longer than 7 weeks and 5 days. But, even if we decided to get pregnant right away and we did, that will never be our first child. He or she just won’t and that’s the reality. And, you know what? I’m finally becoming okay with that. I am finally reaching a place where I will probably accept that pretty soon. Not fully there, but I am closer than I was 4.5 weeks ago. Does it mean that I will stop being sad that I never got to hold my first baby? No, not at all. But, accepting the fact that God allowed it to happen will be a much more healed place to live. I have no idea what God is planning for us in the future and I am still hurting that it doesn’t include our first baby. But, if the Lord does bless us with more children some day, then they will always know that they have an older brother or sister in Heaven. So, for now, I am happy that our baby has at least one framed picture, a candle in his/her honor, a beautiful flower in a pretty vase, and a gorgeous painting. There’s a peace in knowing there are physical items that will stay with us forever, on display, for everyone to see our first baby. Oh, the ants, I think we can’t determine at the moment who is winning this battle. Well, John is currently playing a game on his iPhone while sitting in his chair. So, the lounging around either means he feels that he is winning and isn’t worried about it OR it means that he’s losing and has given up. Hmm, well at least they’re in the living room and not our bedroom? ← The Love of My Life!